In the picture above you can see little Teak tree which has growth in a Teak forest in Java island. 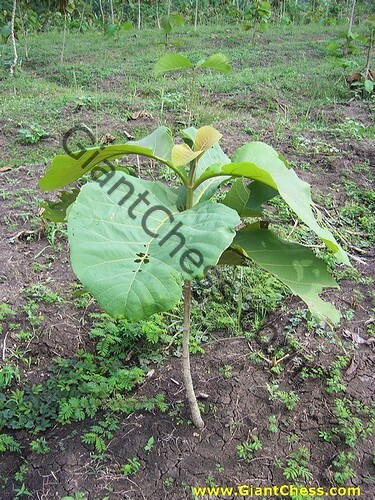 Teak tree need enough time to grow and become big tree, almost years. In Indonesia itself, there are many Teak forest that spread in all provinces. Those Teak forest always produce best quality of Teak wood and often export to other countries. The Teak Tree, or Tectona, is one of the tropical hardwood birches, included in the family Verbenaceae. This tree is originally from the plantations of South East Asia, and can grow to a height of 30 - 40 m. As part of its life cycle, this tree sheds its leaves every year at dry season. Its longevity is very great, the Teak tree often living to an age of 100 years. Teak is especially noted for its capacity to withstand changes in the weather and season. One of the reasons for this is the ability of the Teak to bend, but not break, in the face of high winds.